Laminitis is equally painful to every horse, whether a champion racehorse or a child's pony. The Memorial Wall will unite the names of horses from all time periods, and from all parts of the world who have suffered the pain of laminitis. With the help of research and education, future horses may be spared the fear of laminitis and the knowledge of its pain. Ponies like Flash and Casey are right up there with Secretariat and Barbaro. Beloved trail and amateur show horses Little Dixie, Chief, and Midnight are not far behind. 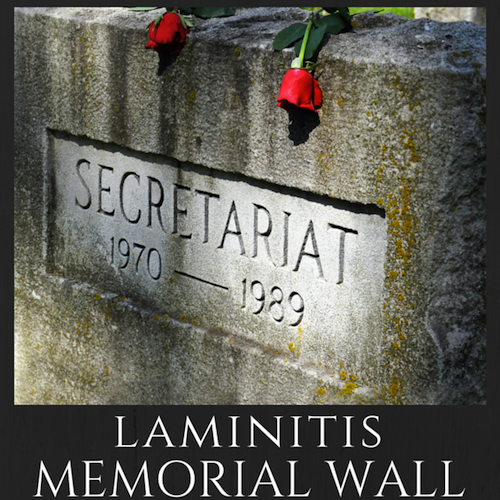 A fledgling “memorial wall” list was launched at Christmas on the Animal Health Foundation (AHF) website (www.ahf-laminitis.org). Donors to the AHF in 2015 may personalize a monetary gift by attaching a horse’s name and a human’s name. The names will appear on the web page, alongside others from all over the world and beneath a stunning photograph by New Jersey racing photographer Sarah K. Andrew, showing red roses draped over Secretariat’s grave at Claiborne Farm in Paris, Kentucky. Secretariat may be the most famous horse to have had laminitis; 2006 Kentucky Derby winner Barbaro was instrumental in bringing the disease to more public attention. Laminitis was listed as the cause of euthanasia for both horses. Among the successful horses reported to have died from complications of laminitis in 2014 were Kentucky Thoroughbred sire Noble Causeway in May, 2014 Kentucky Derby starter Intense Holiday in June, California Thoroughbred stallion Thorn Song in August, Saudi show jumping stallion Presley Boy, Australian champion Standardbred filly Mindarie Priddy and Australian Thoroughbred sire Sequalo in September, and New York Thoroughbred sire Disco Rico in December. While famous horses will be welcome on the "wall", all names are listed in the same size type, and by the order in which their donations were received. Beloved children’s ponies will mix in with champion racehorses; retired roping horses will mingle with pedigreed warmbloods. 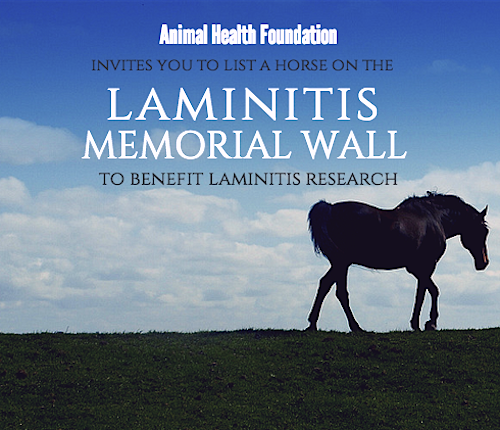 Every donation to the Animal Health Foundation qualifies one horse to be added to the wall. Many donors to the Animal Health Foundation have traditionally been horse owners who have first-hand experience with the disease and want to make a difference by directly supporting cutting-edge research at leading universities. Many have made donations in the memory of special horses in the past but no ongoing list was compiled. Now the list will be maintained and amended with the names of more horses and donors as they are received. Many other donors are veterinarians, equine hospitals, farriers and hoof trimmers who struggle with the disease and want to see research advance. They may now make a donation in the memory of a horse they worked on, and the bereaved owners who hired them. In 2014, the Animal Health Foundation celebrated ongoing research on the role of insulin in the metabolic form of the disease from the Australian Equine Laminitis Research Unit at the University of Queensland, as well as results of an AHF-funded study at Tufts University’s Cummings School of Veterinary Medicine verifying a simple new “Oral Sugar Test”: horses likely to develop the metabolic form of laminitis have a higher insulin response after a direct dose of oral sugar. In 2015, AHF funds are supporting pioneering research on the role of incretins in equine insulin production and regulation at the Queensland University of Technology in Australia, as well as ongoing research projects. The Animal Health Foundation continues to uphold its unbroken 30-year promise to donors: One hundred percent of all public donations to the organization are used only for funding laminitis research. The Animal Health Foundation is a 501 (c) (3) all-volunteer non-profit organization dedicated solely to identifying and funding critical research into the disease of laminitis in horses. Donations are fully tax-deductible. Since 1985, AHF has made certain that any individual who wants to make a difference in beating this terrible disease can see his or her money put directly to work to benefit all horses. 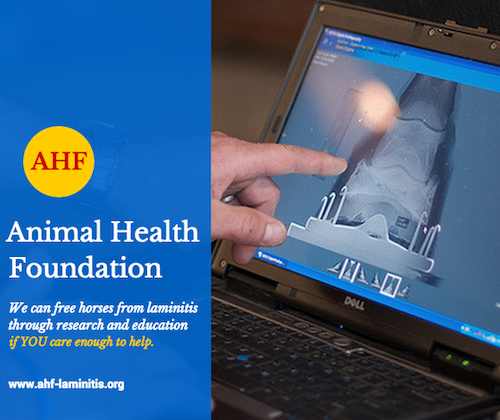 To add your support to AHF efforts, visit the AHF donation website page: http://www.ahf-laminitis.org/p/donate.html. To add a horse and owner/sponsor name to the new memorial page, send an email after submitting your online donation or enclose a note with your check. Thank you for helping the Animal Health Foundation free the horse of this terrible disease.